The Auxiliary Telescope 4, part of ESO's Very Large Telescope Interferometer, on Cerro Paranal mountain. Several European-built observatories in Chile haveescaped damage from the massive 8.8 earthquake that struck the South Americancountry?s central regions Saturday. The European Southern Observatory?s (ESO) three majortelescope centers perched high up in Chile?s Atacama Desert have experiencedpower and communications interruptions due to the earthquake, but remainintact. No injuries were reported at the telescope centers,though the massiveearthquake has killed more than 700 and destroyed an estimated500,000 homes in other regions, according to casualty reports. It is theseventh strongestearthquake recorded in history. The earthquake?s epicenter was located 71 miles (115 km)north-northeast of the city of Concepción and about 201 miles (325 km)southwest of Santiago, Chile?s capital. ESO?s telescopes are engineered towithstand seismic events and were also far enough from the epicenter to escapesignificant damage, observatory officials said. ?ESO expresses its deepest condolences to the families ofthe victims, and its sympathy and support to all those affected by the earthquake,?ESO officials said in a statement. ESO officials urged astronomers slated to visit Chile touse its three telescope facilities to put their plans on hold until furthernotice. ESO has three main observatories, each with multipletelescopes, on the AtacamaDesert at altitudes up to 8,530 feet (2,600 meters). They arelocated in the La Silla, Paranal and Chajnantor regions and include Europe?sVery Large Telescope and the Atacama Large Millimeter/submillimeter Array(ALMA) — which is still under construction. 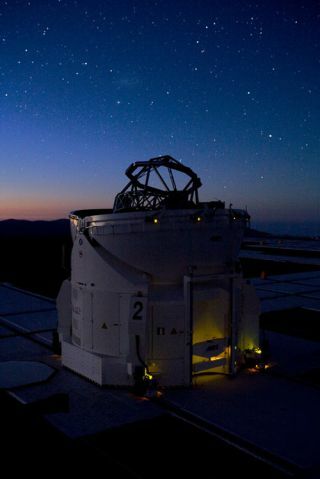 At La Silla, power cuts halted observations overnight onSaturday. Other instruments at Paranal were unaffected by the temblor. ESO officials also plan to build a giant new observatory,the European Extremely Large optical/infrared Telescope in Chile. Its mainmirror will be nearly 138 feet (42 meters) in diameter and the ?the world?sbiggest eye on the sky,? observatory officials have said. ChileEarthquake: Is Mother Nature Out of Control?